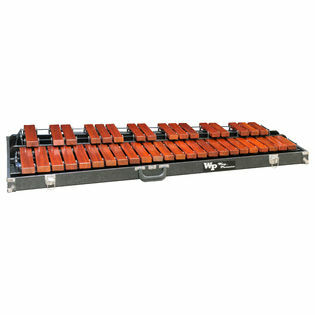 The Wang Percussion 3.3 Octave Padouk Practice Marimba is a portable, great sounding practice instrument at a great price. The additional range allows you to play many pieces that cannot be played on typical 3.0 octave practice marimbas. The added range and hard case on this practice marimba make it superior to many other practice marimbas on the market. The marimba is built into a hard case with a removable top, which protects the marimba when transporting. The case also allows you to store the marimba behing / under a couch, under the bed in your dorm room, in a closet, etc. A double handle makes it comfortable to carry. We suggest using this practice marimba on a double braced x-style keyboard stand, but it can also be played on a table, a bed, etc. Includes 1 pair of marimba mallets. fast delivery, beautiful instrument, nice sound for practicing at home, easy storage (fits under bed). This marimba is amazing for its price! As far as practice marimbas go this is definitely one of the highest quality. The graduated padouk bars have great size in proportion to a concert marimba. It truly feels like you are playing a concert marimba inside a box. I was thoroughly impressed by this bargain.